Winter is barfing up its last feeble attempts at snow, the thermometer no longer reads “You don’t want to know” and Maine is heading convincingly and confidently into spring… or as we call it, mud season in Maine. No longer do I have to put my 29″ inseam legs through 36″ snow drifts running back and forth for target checks and I can shoot at distances longer than one hundred yards without fear of falling face down in the snow and getting dragged off by a coyote. As seen on the table above, while the 308 Winchester has the shortest barrel length, it also has the greatest bore volume and the lowest muzzle pressure when shot with typical match ammunition for each. The 243 Winchester has the longest barrel, but the smallest volume and highest muzzle pressure when its bullet exits. The 308 Winchester has a shorter barrel because that is all that is required to exercise the potential of a 168 grain Match / TAC factory round. 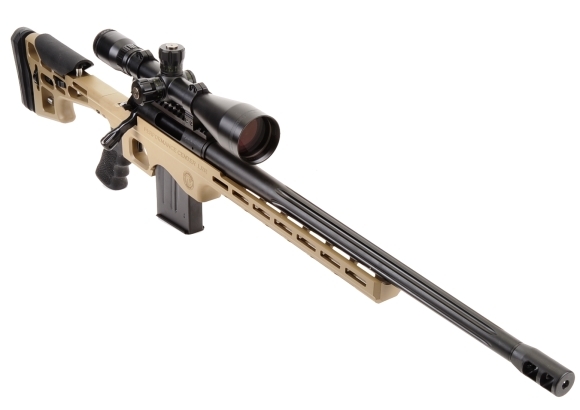 The 6.5 Creedmoor and 243 Winchester follow with increased barrel length, to ensure near complete powder burn and that more of the rounds’ potential have been achieved. That is a simple statement representing a complex issue, but there are many other considerations determining barrel length. Some are operational; a rifle that is compact and more manageable for law enforcement or military personnel in an urban settings. Another consideration might be all caliber variations meeting a similar exterior ballistic criteria. I can’t say beyond speculation as this is not my area of expertise. However, I have spent many hours collecting pressure and velocity data and observing the influences on the same. My real world shooting experience is currently limited to putting holes in paper targets, handload development, stalking and/or posting for slow and inattentive deer or hogs, hunting birds and small game, and eliminating varmints. I’m old. Don’t judge me. I figured, since we opened with a front view, we should also offer view from a shooter’s position. 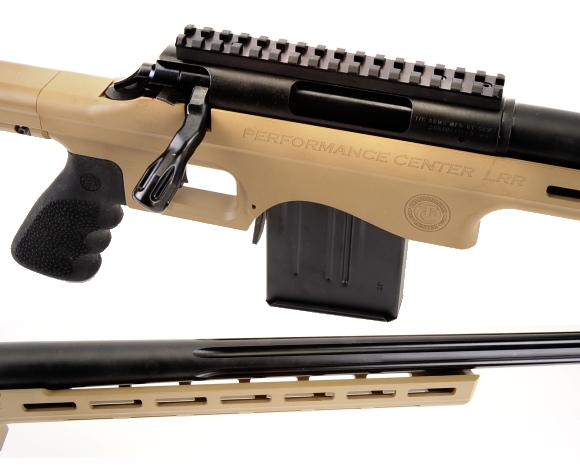 For folks who appreciate designs that are minimalist and functional, the Performance Center – T/C Arms team achieved that goal and made it a good looking firearm in the process. The LRR is supplied a ten round magazine, M-Lok secured Caldwell bipod and recoil dampening muzzle brake. A durable black carry case for rifle and accessories is included. The Performance Center T/C LRR is not a barrel nut product. Rather the Performance Center relies on precision machining to optimal headspacing and minimum spec chambers. 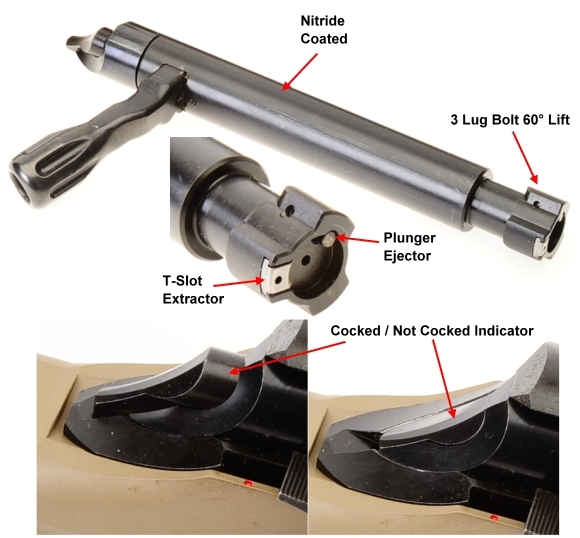 Barrel nuts allow assembly with a lesser level of skilled personnel and it allows an enthusiasts without access to lathe and milling machine to assemble and properly headspace a bolt action rifle. Personally, I like the machinist fit and hand cutting the final headspace with a chamber reamer. The alloy steel receiver and barrel are finished in black oxide and topped with the highly corrosion resistant T/C Weathershield. Adjusting a scope for shooting over long distances can put elevation at the scope’s mechanical adjustment limits. 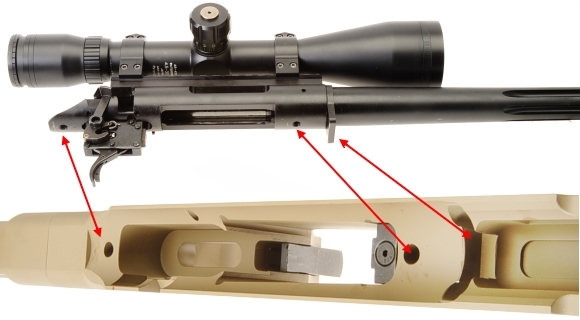 By using a rail with a 20 MOA downward angle, the rifle’s muzzle is raised relative to the scope’s optical centerline and closer to the mid point in mechanical elevation range of adjustment. The barrel is fluted for increased cooling, reduced weight and consistent shot to shot placement. 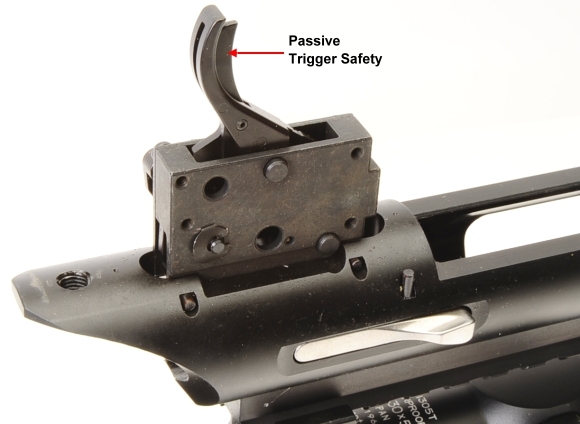 The barreled action is supported by two fasteners at the receiver and further located longitudinally with a vertical recoil lug. The barrel is in no danger of touching the chassis, floating at intended. A little better view of the mounting. The receiver contour matches the chassis contour for a good deal of surface area contact and support. Fastener holes are a close fit to fasteners for more precise locating., but the barrel/receiver sandwiched recoil lug take most of the load under recoil. T/C’s bolt design is… beefy and very T/C Icon like. That is a good thing. The LRR has an 0.853″ bolt body diameter and 0.825″ three lug bolt head. 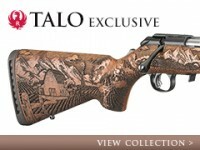 By comparison, a Remington Model 700, a highly regarded, stout action, has a 0.704″ diameter bolt body and 0.990″ dual lug bolt head. At first look it would seem the Remington has greater lug contact area at 0.122 sq.in. However, as there are three lugs on the LRR’s bolt, the actual lug contact surface is also 0.122″ so there is plenty of surface area there ahead of a larger bolt body. The Performance Center trigger is a good one. Virtually no take up, same for overtravel, no creep and clean let off. No noticeable overtravel. Pull is light, adjustable between 2.5 lbs and 3.5 lbs. Man… I’ve been singing along with Alexa while writing, Neil Young “After the Gold Rush”. I think I hurt myself hitting some of those notes. Damn Canadians. Think I’ll try Jackson Brown. 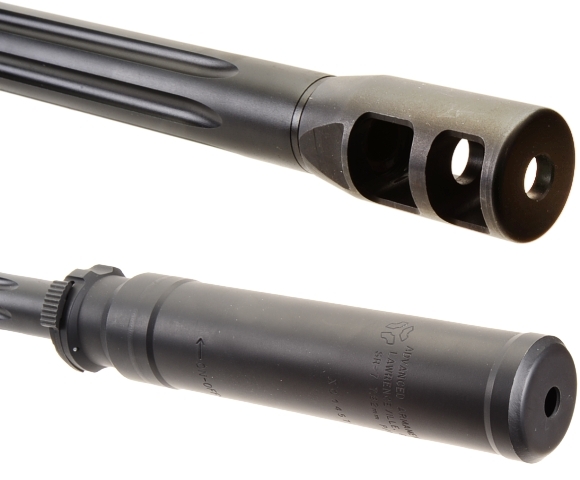 In addition to barrel fluting to enhance cooling, the T/C LRR muzzle has 5/8″-24 threads. 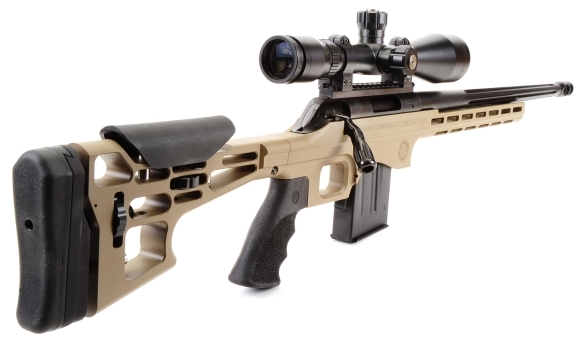 The rifle is supplied with a very effective recoil reducing and barrel leveling brake and the thread standard allows easy mounting of “other muzzle devices”. I elected, or my ears elected, to mount a silencer. Yes it is properly called a silencer by the original patent and the current manufacturers of the products. Yes, a rifle with a silencer installed is referred to as being suppressed. There’s a minute of my life I won’t get back, but it will hopefully prevent those emails that begin with “You don’t know blanky-blank about suppressors”…. even though I know it won’t. I need some coffee. I’m going to cut off here and round up enough ammo to give the Performance Center T/C Long Range Rifle a proper work out. I will be back with the results.